The Creative Regions National Summit explores liveable, sustainable and healthy regional communities and the vital role of arts and culture within this. More information regarding the 2019 Summit, to be held in November 2019, will be announced shortly. The inaugural Summit, held on Monday 16 October 2017 at Parliament House, Canberra included key note lectures, panel discussions and presentations by diverse speakers. Vic McEwan | Artistic Director of The Cad Factory. 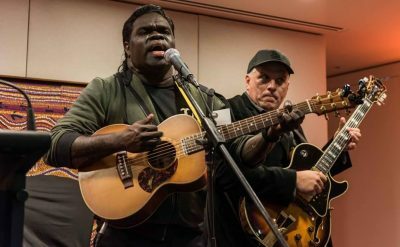 Renowned Yolngu songwriter and musician, Gawurra, was the featured artist at the 2017 Creative Regions National Summit. The Creative Regions National Summit Reception was hosted by the Parliamentary Friends of Regional Arts. The Reception provided the opportunity for Summit attendees, Members of Parliament and Senators to discuss and reflect on the themes of the Summit. For more information on the Summit, please get in touch with us. View photos from the 2017 Summit here.